The page editor is accessed by hovering over a text block and clicking the pencil icon. It functions much the same as Microsoft Word or other word processing applications. 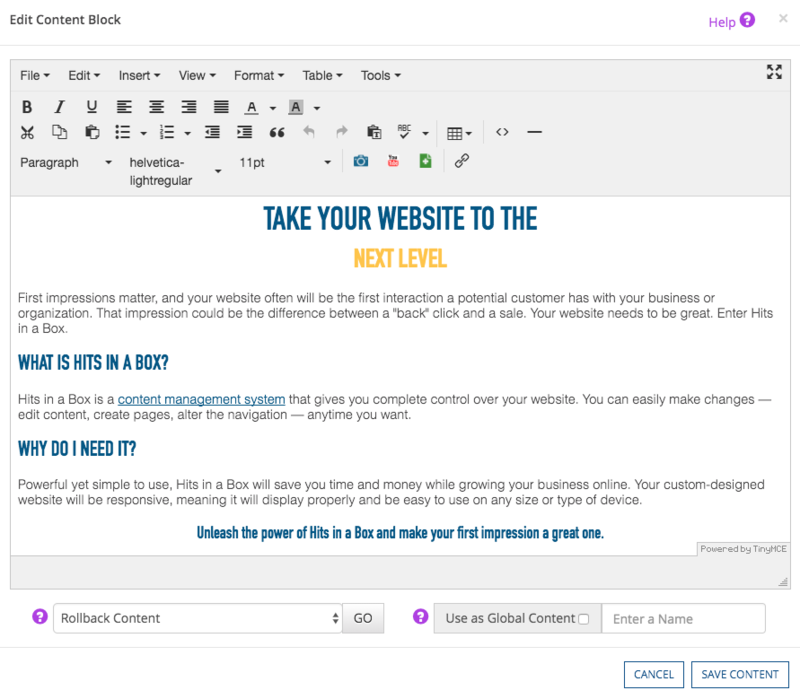 The page editor is used to create, edit, and delete written content, images, and graphics on your web pages. Click to add an image to a content block or to upload an image (also found under the "Tools" menu > "Gallery"). To edit an existing image in a content block, click on it then the blue camera icon. Go to the "Insert" menu > "Insert date/time"
Go to the "Insert" menu > "Anchor"
Provides a full-screen view of the page editor (or go to the "View" menu > "Fullscreen"). Click again to collapse the page editor to its original position. Select the dropdown to view the last 10 saved versions of this text block. Click the ROLLBACK CONTENT button to restore the selected version.